A bus full of schoolchildren was hijacked and set on fire by its own driver in an apparent protest against migrant drownings in the Mediterranean, Italian authorities said. All 51 children managed to escape unhurt before the bus was engulfed in flames on the outskirts of Milan, Italy's business capital. Police named the driver as Ousseynou Sy, a 47-year-old Italian citizen of Senegalese origin. "He shouted, 'Stop the deaths at sea, I'll carry out a massacre'," police spokesman Marco Palmieri quoted Mr Sy as telling police after his arrest. 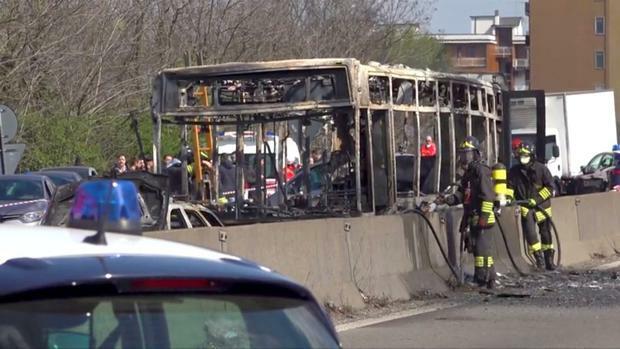 A video posted on Italian news sites showed the driver ramming the bus into cars on a provincial highway before the fire took hold. Children can be seen running away from the vehicle screaming and shouting "escape". Mr Palmieri said some children were taken to hospital as a precautionary measure because they had bruises or were in a state of shock, but none suffered serious injuries. A teacher with the middle-school children was quoted by Ansa news agency as saying that the driver had said he wanted to get to the runway at Milan's Linate Airport. The Italian government has closed its ports to charity rescue ships that pick up migrants off the Libyan coast. Mr Salvini says this has helped reduce deaths because far fewer people are now taking to the sea. Eleanor Barlow A man and a teenager have been arrested after a 24-year-old barristers' clerk was stabbed to death in a brawl outside a pub. Jane Dalton Detectives in Cyprus are searching for a six-year-old girl whose mother's decomposed body was found in an abandoned mineshaft, together with that of another woman.